Finish Strong is a powerful platform for leading your team to success. In this breathtaking gift book, you will share in the triumphs a variety of individuals who all shared a common value – the desire to overcome their obstacle and ultimately Finish Strong. In addition, Dan Green shares some innovative ways that he has incorporated the Finish Strong attitude into his personal and professional lives. Amazing Stories of Courage and Inspiration! 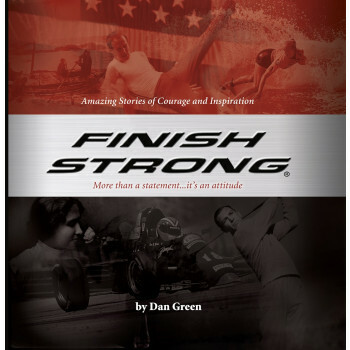 Included with purchase: A FREE DVD of the Finish Strong Movie! The words Finish Strong instantly and clearly communicate a performance goal perhaps better than any other two words in the English language. In this breathtaking gift book, you will share in the triumphs a variety of individuals who all shared a common value – the desire to overcome their obstacle and ultimately Finish Strong. In addition, Dan Green shares some innovative ways that he has incorporated the Finish Strong attitude into his personal and professional lives. Finish Strong is a powerful platform for leading your team to success. Use the book to kick-off or close your next meeting, conference or event. Give the book to your customers and prospects as a way to reinforce your commitment to them. Anyone with goals or ambition should read this book. Regardless of what came before or of what has yet to come, what matters most is how you choose to respond to the challenge in front of you. Will you lie down or will you fight? The choice is yours. Choose to Finish Strong! Ways to Use: Give this book away at your next meeting or event. Perfect for Leadership development, Executive Retreats, Team Building, Management training.